1 x Pro Duo Card Reader. 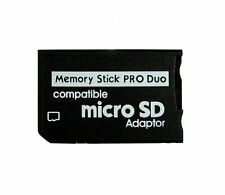 Supports MicroSD 256MB - 2GB | MicroSDHC 4GB -32GB (Any Size MicroSd Card will work with this adapter). We might require you to send us photo/s of the item received and also your original item so we can compare and conduct necessary actions. Put them (the larger in the slot #1) inside the pro duo adapter. 5 x MS Pro Duo Adapter. Do this for every affected card. Now you can re-use your micro SDHC card(s) in other devices. Support: 2 x 512 GB micro SD cards ( Still depends on your Official or Custom Firmware. ). Put them (the larger in the slot #1) inside the pro duo adapter. 1 x MS Pro Duo Adapter. Do this for every affected card. Now you can re-use your micro SDHC card(s) in other devices. If only 1 microSD(HC) cards is used, it must be inserted into slot#1 in order to work. This ALL IN ONE Card Reader provides the easiest way to expand your connectivity for your desktop or laptop.You can move, save, copy, or delete many types of data from your card for example photos, videos, MP3s. Water resistant holder is made with premium quality TPV material seal which hinders any unwanted debris and water from entering the case. THE ULTIMATE CARD HOLDER: This ultimate multipurpose SD card and storage case is ideal for storing and organizing your cards. 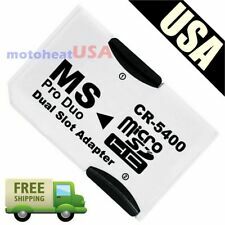 CR-5400 converts 2 microSD(HC) cards into one MS Pro Duo stick. Do this for every affected card. Now you can re-use your micro SDHC card(s) in other devices. 3x Adapter card. The adapter works with only one microSDHC card as well. This review is from: MS PRO DUO Adapter. 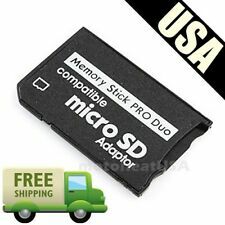 Converts Two MicroSD or MicroSDHC Cards To MS PRO DUO. Support up to 256GB x 2 ( tested ). 512GBx2 could be OK, but never tested. ManufacturerOEM adapter. Multi-card reader, supporting all main memory card types. High-speed USB3.0 interface and with support for these card types: CF, XD, M2/micro SD/SDHC/SDXC, SD/MMC/SDHC/SDXC, MS Pro/MS Duo/MS Pro Duo/MS Pro HG/MS XC, SDXC UHS-I: up to 2TB, MS Pro HG/MS XC: up to 32GB, CF / Ultra DMA mode 7. PR O Duo M emory Stick Adapter. Color: Black These All-in-One USB card readers allow you to use most memory cards with your computer. The card readers are fast. In testing we were able to achieve over 20MB/s with a Class 10 Micro-SD card. There are four slots: SD / SDHC / MMC Micro-SD / TF MS / MS Duo / MS Pro Duo Micro MS / M2 . This SuperSpeed USB 3.0 SD / MicroSD Card Reader and Writer is the perfect solution for super-speed data and file transferring. Up to 10x faster than USB 2.0 card readers, this new device will transfer data up to 5Gbps! That's fast! Quickly download HD videos, HD photos, and documents to your computer. PR O Duo M emory Stick Adapter. 10x Wholesale Lot. PR O Duo M emory Stick Adapter. 20x Wholesale Lot. SD slot can read and write at UHS-II speeds. It is an unpowered hub right out of the box. CF slot is designed extra deep for a secure fit using type 1 cards. It can contain 4CF 8SD 9TF 1Card PIN 1Standard SIM 2Micro-SIM 2Nano-SIM 1 Card Pin. This storage box is an ideal choice for frequent travellers as well as for multi sim card users. SNAP-ON LOCKING SYSTEM – The case has double ergonomic Snap-On locking system that not only ensures safety but also makes it easy to use with easy open and close quick release lock buckle. Supports MS,MS PRO, MS DUO, MS PRO DUO, HS MS, SD, Mini SD, Micro SD (T-Flash), MMC, RS-MMC. USB 2.0 12-in-1 Mini Card Reader (SD/MS/micro SD) CR-BCA1-A-US - New. The Mini card reader with pocket sized design makes an ideal travel accessory. USB 2.0 Multi Slots Card Reader Writer MICRO MINI MMC M2. MMC micro card. SDHC CARDS. M2 (adapter required). USB 2.0 Premium Quality Multi card reader & writer. MS Pro Duo. Mini SD(adapter required). Ultra II SD. We aggressively support our cards for one simple reason, our cards work. If you have a problem you can rely on us to fix it. Now you know the difference. Delkin Platinum Pledge. Plus, all slots can be accessed concurrently for efficient card to card transfer. Kingston’s USB 3.0 High-Speed Media Reader reads all major card format types and supports UHS-I and UHS-II SD card speeds, making it ideal for photographers, videographers, design studios and printing houses. Transfer two hours of high definition 1080p video in 26 seconds, almost 10,000 images in less than a minute or 2000 MP3 files in less than 13 seconds. With capabilities to write data at speeds over 30MB/s, the SD 600X series supports HD and 3D video recording as well as rapid-fire RAW photography in DSLRs. 57-in-1 Card Reader and Connecting USB Cable. Lightweight reader, Picture shown is for illustration purpose, actual item may vary. 3 Years Manufacturer Warranty. Compatible PC & MAC. Excellent Interface. Transfer two hours of high definition 1080p video in 26 seconds, almost 10,000 images in less than a minute or 2000 MP3 files in less than 13 seconds. UDMA, SDHC & SDXC Enabled. CF UDMA, SDHC & SDXC Enabled. 50-in 1 Card Reader-Writer. Excellent Interface. Enables fast download. 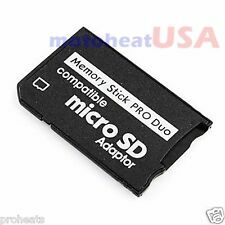 Micro SD SDHC TF to Memory Stick MS Pro Duo Reader PSP Adapter Converter. Condition is New. Dispatched with Royal Mail 2nd Class Letter. USB Multi Card Reader. Compact USB 2.0 Card Reader which is compatible with. 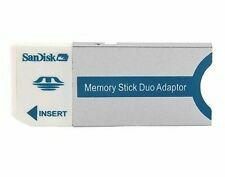 SKU: AD.duo-PRO-SNDnBK[x2] Condition: New, Bulk, adapter only. It features 7 slots to support 73 types of cards. The SIM card function will allow you to back up, sort and modify your phone records from the comfort of your computer. Fully compatible with all versions of SD/HC, Micro SD, CF, XD, MS/Pro Duo and SIM cards. 57-in-1 Card Reader and Connecting USB Cable. 3 Years Manufacturer Warranty. Compatible PC & MAC. Excellent Interface. 50-in 1 Card Reader-Writer. 3 Years Manufacturer Warranty. Compatible PC & MAC. Excellent Interface. 50-in 1 Card Reader-Writer. 3 Years Manufacturer Warranty. Compatible PC & MAC. Excellent Interface. Enables fast download.